Falls are the No. 1 cause of injury-related hospitalizations among Canadian seniors. They are also the cause of 95 percent of all hip fractures in older adults. As we enter the winter months with its slippery ice and snow, here are six ways to help protect your loved one from falls. 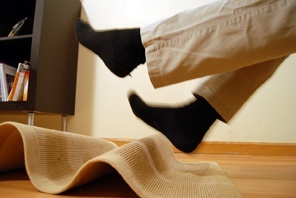 Falls can be serious, sometimes fatal, for older adults. According to the Government of Canada, falls are the No. 1 cause of injury-related hospitalizations among Canadian seniors, and between 20 and 30 percent of older adults fall each year. On average, a senior is hospitalized because of a fall every 10 minutes. Transitions of care can be any transfer your loved one makes between a facility such as a hospital, a skilled nursing facility, an assisted living community or their home. In the 30 days following discharge from a hospital or care facility, the chance of readmission is high. Falls are the No. 1 cause of injury-related hospitalizations among seniors. They are also the cause of 95 percent of all hip fractures in older adults. Here are nine ways to help protect your loved one from falls in winter months.